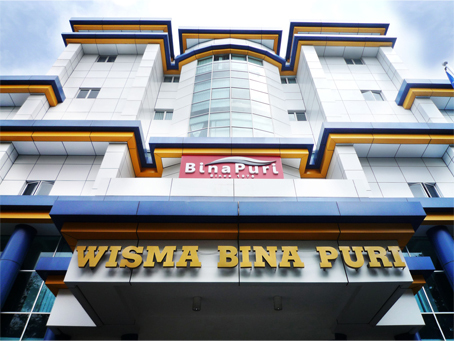 Bina Puri Holdings Bhd is a public listed company on the Main Board of Bursa Malaysia with more than 40 years of work experience in civil and building construction both locally and internationally. The Group’s diverse business activities include investment holdings, civil and building engineering management, property development, highway concession, quarry operations, manufacturing of construction materials, utilities and hospitality management. The Group is certified with the Integrated Management System of MS ISO 9001:2008, OHSAS 18001, MS 1722:2011 and MS 14001:2004 certifications and won many accolades worthy of mention including the Prominent Player Award 2005 (MCIEA 2005), the Contractor Award 2007: Grade G7 (MCIEA 2007), the Major Project Award 2012 (MCIEA 2012) and the International Achievement Award (MCIEA 2008, 2011 and Special Mention in 2016) by the Construction Industry Development Board of Malaysia (CIDB). Bina Puri also won prestigious award of the BrandLaureate-Best Brand Awards 2011-2012 for the Corporate Branding – Best Brand in Construction. At the Asia Pacific Property Award 2016-2017, Bina Puri won two award categories- the Highly Commended Residential Renovation/ Redevelopment Malaysia and the Highly Commended Commercial Renovation/ Redevelopment Malaysia. Bina Puri has successfully completed projects such as roads and highways, bridges and interchanges, waterworks, land reclamation works, residential and commercial buildings, hotels, hospitals, airports and government complexes. The group has international presence in which it has successfully undertaken projects in Cambodia, China, Brunei Darussalam, United Arabs Emirates, Saudi Arabia, Pakistan, India, Indonesia and Thailand. Bina Puri’s notable list of investment portfolios includes the 33km toll highway linking KL-Kuala Selangor Expressway, the Main Place Residence and Mall at USJ 21, and power plants in Indonesia.